A hot water cylinder is used for storing hot water for domestic use. Cylinders are normally heavily insulated and can retain heat for a number of days. 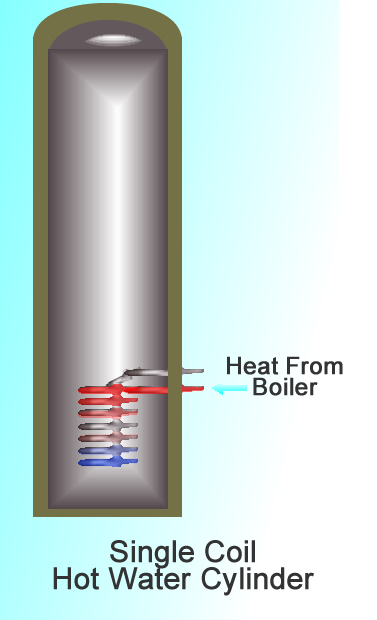 Hot water is heated in the cylinder using a coil heated by another source, such as a gas boiler, or using an electric immersion heater within the cylinder itself. Twin coil – used when there are two sources of heat, such as solar water heating panels or a woodburner together with a gas boiler. 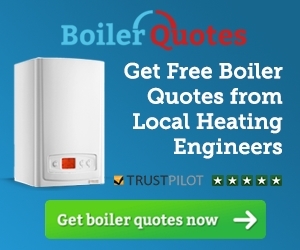 Most hot water cylinders have the option of an electric immersion heater, often 3kW, which heats the water more slowly than a gas boiler, which typically has a heat output of 15kW-24kW. Heating water using an electric immersion heater is generally slower and more costly than using other forms of heating such as natural gas. Vented cylinders are usually connected using a vent pipe to a cold water tank in the loft. 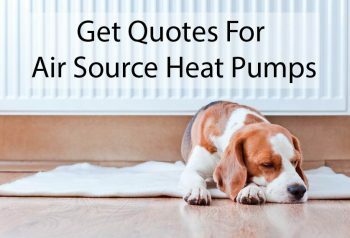 They are open to the pressure of the atmosphere and are generally used in gravity fed heating systems. In the diagram to the right the cylinder is marked with a 2. 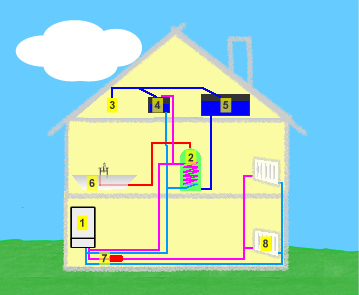 For more details on gravity fed systems see A Guide To Central Heating Systems. 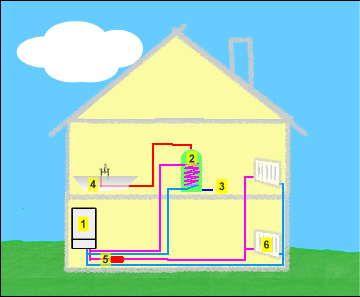 Typically hot water from a vented system will be supplied at about 0.2 bar. This is about 10% of the mains water pressure supplied by an unvented system. Whilst a vented cylinder in isolation tends to be cheaper than its unvented equivalent, as it does not need to be built to withstand such high pressures, a separate cold water tank and hot water overflow tank are also required. Unvented cylinders are pressurised to main water pressure so provide a strong flow of hot water. 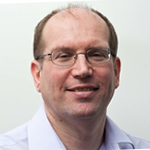 They tend to be more expensive than unvented systems as they need to withstand higher pressure. They are generally used in high pressure central heating systems such as the one shown in the diagram on the right. Within unvented cylinders there is normally an expansion vessel which allows any pressure to be relieved. Also they will have a tundish which releases the pressure if the hot water pressure becomes excessive. This type of hot water cylinder is used for most heating systems used in domestic properties. It takes water heated from one source, usually a gas or oil-fired boiler, and circulates it in the cylinder to heat the water stored in it. Once the water in the cylinder has reached the desired temperature then a valve normally switches off the circulation of the hot water from the boiler. When the boiler is switched off, water can also be heated using a 3kW electric immersion heater if one is fitted. Twin coil hot water cylinders are used when there two different methods of heating water are used. 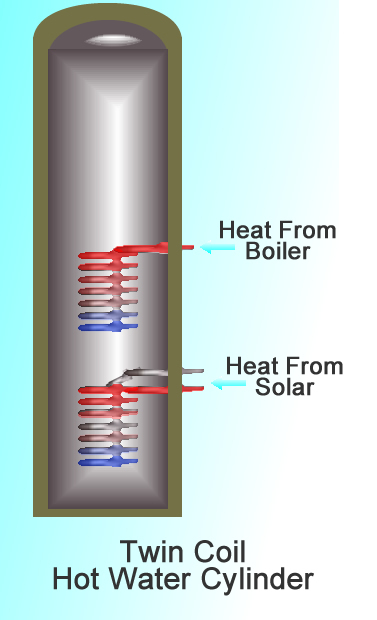 In the example on the right, solar water heating panels on the roof are used to heat as much of the water as possible using the lower coil. During the day the stored water temperature rises as the solar energy heats the water. On a summer’s day this may well heat 90% or more of the hot water needed. However on a cloudy winter’s day then maybe only 10-20% of the hot water is needed. The secondary heating, in this case from a gas or oil-fired boiler, will supplement this by providing heated water to the upper coil. Once the boiler has heated the water in the top half of the cylinder to the desired temperature it will switch off the flow of heated water from the boiler. The twin system means that the heating from the lower coil has the first opportunity to heat the water and only if the water in the top half of the cylinder is not at the right temperature will the upper coil heating be used. As well as solar water heating, a woodburning system may be used for the lower coil. As someone who is also in the HWC trade I would like to say thanks for putting this information out there for people to find. Tells you everything you need to know and I would think it has helped many.